You may have heard about the negative calorie diet plan. According to supporters of this diet, certain foods actually cause you to lose weight rather than gain it. The diet plan has been featured on TV shows such as The Dr. Oz Show. It almost sounds too good to be true, which is why many people wonder: what is the reality of negative calorie foods? Can eating a negative calorie diet actually help you lose weight, or is this just a silly fad? The truth is that negative calorie foods can help you stay healthy and lose weight. However, you cannot eat an entire diet comprised of these foods, as that can be unhealthy. Rather, by adding more negative calorie foods to your diet, you can help burn off the pounds in a safe, healthy way. What Is the Concept of Negative Calorie Foods? For many people, the concept of negative calorie foods can be difficult to understand. Food has calories, so how could eating any type of food result in calories being burned? Wouldn’t you gain weight no matter what? A negative calorie food burns more calories than it provides. Even though the food in question contains calories, the idea is that your body will use more energy to digest the food, creating a caloric deficit. For a food to be considered “negative calorie,” it has to have a low amount of calories while also promoting high calorie burning in your body. How Do Negative Calorie Foods Work? Any physical activity helps burn calories. For instance, if you’re sitting down, something as simple as jittering your leg or tapping your hand is actually burning a very small amount of calories, though the amount is small enough that you won’t see any difference in your weight. When we’re eating, we also burn calories. In fact, we actually burn more calories through eating than you may think—roughly five to 10 percent of the calories-burning we do daily is thought to be done through chewing and digestion. While more research is needed to confirm this, the science behind the concept suggests that these foods do help with losing weight. Eating a diet that is only comprised of negative calorie foods is a bad idea. It could cause unhealthy, rapid weight loss, as well as other possible issues. The idea when coming up with your negative calorie diet menu is to integrate more of these foods into your daily diet. It’s important to balance your diet with a mix of fruits, vegetables, legumes, and grains, ensuring that you still get the fiber, fat, and nutrients you need to be healthy. Unlike other diets, the negative calorie diet is not very difficult or restrictive. There are many good options for breakfast, lunch, dinner, and snacks. Most negative calorie foods fit into one of two categories: fruits or vegetables. There’s a reason why you were always told to eat your fruits and vegetables. These foods not only contain vitamins, nutrients, and antioxidants, but they are also very low in calories and high in fiber. When choosing a negative calorie food, look for fruits and vegetables that contain lots of water and fiber. High-fiber foods are good for digestion and can help burn off more weight. Celery: Celery has some of the highest water content available in a vegetable—up to 75% of celery is water, and the other 25% is mostly fiber. One cup of celery has only 19 calories. Lettuce: Lettuce is another vegetable with a very high water content. 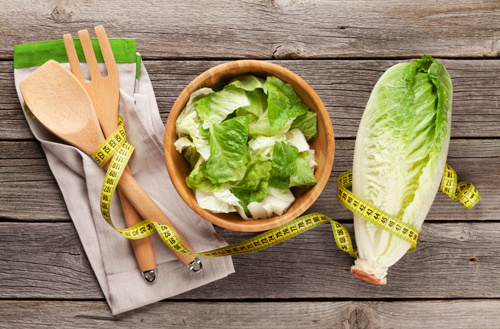 In fact, it’s very difficult to gain weight by eating lettuce, as one cup has only eight calories. However, adding fatty salad dressing and toppings to your lettuce can turn it from a negative calorie food into an unhealthy choice. Cucumbers and pickles: Both cucumbers and pickles (which are made from cucumbers), are very low in calories; generally, one cup of either of these vegetables has around 16 to 17 calories. The pickling process can increase the calorie content slightly, but pickles are still a great choice. Grapefruit: Grapefruit are a little higher in calorie content than some of the other negative calorie fruits, but with only 74 calories per cup, they are still a healthy choice. Around 60% of a grapefruit is water. Blueberries, raspberries, strawberries, and cranberries: Berries are low in calories, which makes them a very healthy as a snack or as an addition to yogurt. Berries are also loaded with antioxidants. Citrus fruits: Fruits like tangerines, oranges, and lemons are all great negative calorie fruits that are high in water, fiber, and vitamins. Some other vegetables and fruits that can be eaten on a negative calorie diet include apples, cantaloupes, honeydew melons, mangoes, peaches, asparagus, broccoli, cauliflower, spinach, beans, tomatoes, zucchini, and turnips. Is it Possible to Develop a Negative Calorie Drink? Since we have negative calorie foods, some may wonder if it would be possible to create negative calorie drinks; some types of soda and soft drinks suggest that they can help burn calories. The truth is, it’s not possible for a drink to be negative in calories. Drinking does not involve digestion or chewing, which are the main activities that burn calories. Even if the drinks have added stimulants (such as caffeine) or are very cold (which causes the body to work harder to bring them to the right temperature), drinks do not require much energy for our bodies to handle. If you want to lose weight using a negative calorie diet, then you need to be eating at a caloric deficit. A caloric deficit is when you eat fewer calories than you burn. Even if you are eating negative calorie foods, you won’t lose weight if you’re still eating other unhealthy foods or are well over your daily calorie limit. A caloric deficit forces your body to burn fat; however, it’s important to not have a deficit that is too extreme, as that can be unhealthy. You want to eat roughly 20% fewer calories than you burn each day. This ratio will allow you to lose weight in a healthy way. For instance, if you burn 2,000 calories, you should eat 1,600 calories per day to lose weight. The best way to determine the right caloric deficit for you is to use an online calorie calculator, which will determine how many calories you should eat based on your gender, height, and activity level. If you want to find some tasty meals for your negative calorie diet, then a good soup can be the perfect choice. This negative calorie diet soup recipe provides a tasty meal that will help you burn calories. To make a delicious negative calorie soup, all you need is six cups of vegetable broth and your choice of negative calorie vegetables. You can add onion, turnip, celery, tomato, cauliflower, zucchini, and broccoli for flavor. Combining these vegetables with the broth is all you need. In a pot, bring the soup to a boil and then reduce to a simmer, letting it heat for roughly 20 minutes. For flavor, you can add herbs, pepper, salt, or even some garlic. However, when you eat your soup, avoid added items like cheese, crackers, or bread, which will add calories to your healthy meal. You can also experiment with other negative calorie diet recipes. For instance, salads are often unhealthy due to the fatty dressings, croutons, or bacon bits that are added in. By using lettuce, and adding in other vegetables (such as cucumber, tomato, and onion) or fresh herbs (such as dill, basil, or oregano)—and leaving off the dressing or oil—you can have a healthy negative calorie meal. If you must have dressing, then go for a simple homemade olive oil and vinegar combination; it won’t be zero-calorie anymore, but it’s healthier than most prepared dressings. However, negative calorie diets do not replace exercise, fitness, and other healthy lifestyle choices. For instance, if you eat a negative calorie diet but don’t exercise at all, you may not see substantial weight loss. As well, if you add negative calorie foods to your diet plan, it really doesn’t help if you have cake, pie, or dessert afterward. Spend some time creating the right negative calorie diet menu. By eating this type of diet, exercising regularly, and cutting out unhealthy food and lifestyle choices, you can shed the pounds easier than you would imagine. The negative calorie diet is an effective tool for helping you get back to the weight you want. While a negative calorie diet can help you lose weight, a diet that is too strict can be unhealthy. With any diet, you do not want to starve yourself. Not only can this cause other health problems, but it can also make it harder to lose weight. Some risks and precautions to note with the negative calorie diet are as follows. Ensure that your caloric deficit is only 20% lower than your normal intake. Ensure that you are still getting proper amounts of protein, calcium, and other nutrients; these are best received through legumes, meat, and dairy. There’s no need to limit yourself only to fruits and vegetables. If you take the right precautions and stay safe, then the negative calorie diet can help you get back down to the weight you’ve always wanted! “15 Foods That Burn More Calories Than They Contain,” Foodie Junky web site; http://www.foodiejunky.com/8-negative-calorie-foods-what-should-you-be-eating/, last accessed March 28, 2016. Adams, M., “The top five negative-calorie health foods that burn fat while making you feel full,” Natural News web site, January 4, 2011; http://www.naturalnews.com/030912_negative-calorie_foods_burn_fat.html, last accessed March 28, 2016. Beattie, D., “Would it be possible to develop a ‘negative’ calorie drink” Quora web site, November 20, 2013; https://www.quora.com/Would-it-be-possible-to-develop-a-negative-calorie-drink, last accessed March 28, 2016. “Calorie Deficit to Lose Weight – Setting Your Calorie Intake for Weight Loss,” A Calorie Counter web site; http://www.acaloriecounter.com/diet/calorie-deficit-to-lose-weight/, last accessed March 28, 2016. “How to Eat on the Negative Calorie Plan,” The Dr. Oz Show web site, February 11, 2016; http://www.doctoroz.com/article/how-eat-negative-calorie-plan, last accessed March 28, 2016. “Negative Calorie Diet,” Diet web site; http://www.diet.com/g/negative-calorie-diet, last accessed March 28, 2016. “Negative Calorie Soup,” The Dr. Oz Show web site, February 8, 2016, http://www.doctoroz.com/recipe/negative-calorie-soup, last accessed March 28, 2016. Reinagel, M., “How ‘Negative-Calorie’ Foods Help You Lose Weight?” The Huffington Post web site, January 6, 2013; http://www.huffingtonpost.com/monica-reinagel-ms-ldn-cns/negative-calorie-foods_b_2069073.html, last accessed March 28, 2016. “The truth behind negative calorie foods,” Johnson Fitness web site; https://www.johnsonfit.com/blog/the-truth-behind-negative-calorie-foods, last accessed March 28, 2016.